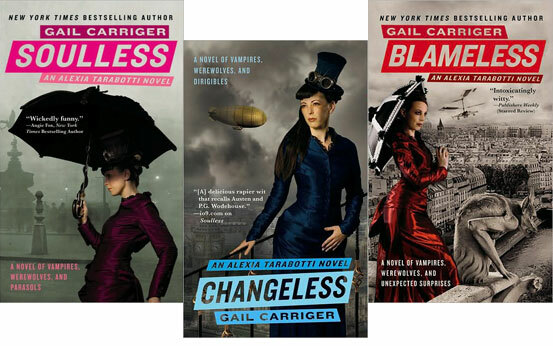 As I understand it, Soulless was originally intended as a one-off, which is why it ends with something like the traditional romance ending, as the “ugly duckling” Alexia Tarabotti is engaged to be married to Lord Maccon, the werewolf who runs the British government’s supernatural investigation bureau, but Orbit liked the novel so much that they encouraged Carriger to expand the storyline—thus, Changeless takes place shortly after they’ve been married, plunging them into a new investigation (which leads to a brilliantly parodic trip to Scotland) that ends on a personal cliffhanger which carries over into Blameless, which is now the pivot point of a projected five-book series. In a post-Man Booker interview with the New York Times, Howard Jacobson admits, “When I hear people call me a comic novelist, I want to scream.” It’s an apt thing to remember when reading The Finkler Question—yes, it has quite a few funny bits, but the novel’s humor is always in service of a more fundamentally serious purpose. Jacobsen can—and does—take a character like Julian Treslove, a middle-aged Brit with an excessive sense of Jews as the exotic other, and play him for laughs. But that initial premise—Treslove’s conviction that a random mugging was in fact an “accidental” anti-Semitic assault, pushing him towards a dance with Jewish identity—gradually gives way to the reality of ongoing anti-Semitic violence in present-day England; meanwhile, Treslove’s two closest Jewish friends, who share a roughly equal amount of the novel’s focus, are grappling not just with Jewish identity but, after the deaths of their respective wives, their own mortality. There are some threads I’d like to have seen Jacobson pursue a bit further; in one passage, for example, Sam Finkler—a public intellectual who has built much of his reputation on being a Jew who’s ashamed of Israel—learns that his own son has been injured in an anti-Semitic incident, but the scene gets turned around and Finkler is forced to confront the consequences of his moral philosophy… and then his family drops off the radar entirely. And, okay, I get that Treslove and Finkler (and their former teacher, Libor, with whom they’ve stayed in touch) are all men with tenuous emotional connections to other people, but, still, the tight focus on the trio does get a bit claustrophobic at times. 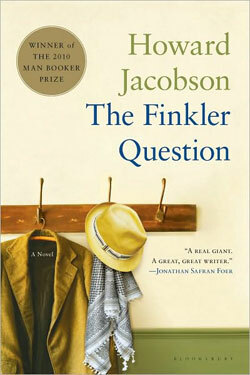 In fact, The Finkler Question tends to be a bit more “interior” of a novel than I usually go for these days; although things happen over the course of the novel, it’s less a novel in which things happen than one in which characters think deeply about their situations and have extended meaningful conversations with each other. (In a certain sense, those aspects of the novel remind me of the late Robertson Davies, although Davies was always effective at combining those interior/philosophical elements with plenty of action, sometimes fantastic and frequently quite absurd, so Jacobson seems subdued by comparison.) And, in the interest of full disclosure, I’d actually place it just behind two novels that it beat out for a spot on the Man Booker longlist, Paul Murray’s Skippy Dies and David Mitchell’s The Thousand Autumns of Jacob de Zoet, as far as personal preferences go. But when I think about the novel in the terms that Jacobson sets out for himself in that Times interview (“Jane Austen, with a little bit of Yiddish”), I believe it hits the mark… and it absolutely rewards the attention from you that it demands.